Do you have a little piece of flannel, or something made from it, that you can show the sellers in the stalls? Maybe they have something similar, like brushed cotton. Barbara - I asked at the cotton stall, since flannel is a type of cotton. They do know what flannel is, they just didn't have it! Wow, that you can't find flannel. That market does look fun to browse around. I am jealous of your fabric market! If you can't find flannel in Amsterdam, you might try ordering from thousandsofbolts.com I have bought quite a bit of fabric from them, the quality is good and they are quite inexpensive, which makes the added international shipping costs not too bad. Voor flannel kijk ik altijd bij Jan Sikkes, maar ik geloof niet dat die in Amsterdam zit. Ben benieuwd wat je ermee wil gaan doen. 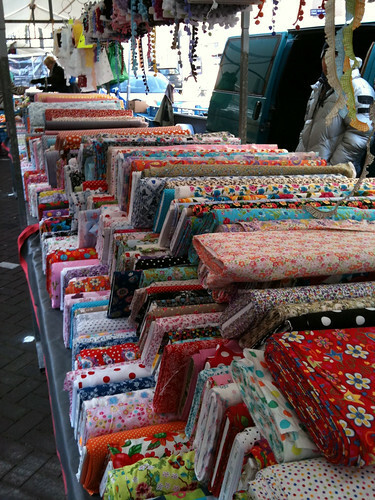 What a fabulous market- Love the lines of fabrics, so fresh and pretty! Oooooh! I wish I could go back to that market! That's the same stall where I bought all my fabric... Good luck with the flannel hunt. Oh, my I wish we had this in Germany! *drool* For that matter we didn't have that back home in Texas.